Last Monday September 24th our hard work was put to the test. 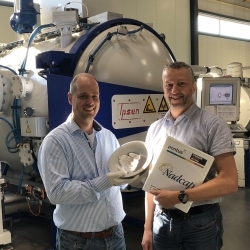 During four days a Nadcap auditor examined the complete heat treatment process at Pontus with the objective of accrediting the organization to the international aerospace standard: Nadcap. The conclusion of the audit was that Pontus can be approved as an aerospace heat treatment subcontractor after correcting a few minor issues. The audit was performed thoroughly and with focus on details. This resulted in five minor improvements to the quality system already in place at our facility in Enschede. According to the auditor this is a remarkable achievement by a small company such as Pontus. Initial audits usually end in more non-conformities or will be aborted prematurely.